We are Snowflakes India - One of the Top Kennels into Golden Retriever Kennels in the Asian Region working Towards Improvement of Breed Standards in India. About Us: Most of the people into Golden Retrievers Know about Snowflakes and the People Behind, For the Few who are New this is who we are Industrialists and Professionals with a Passion Towards Golden Retrievers and Working towards the improvement of the breed in India. 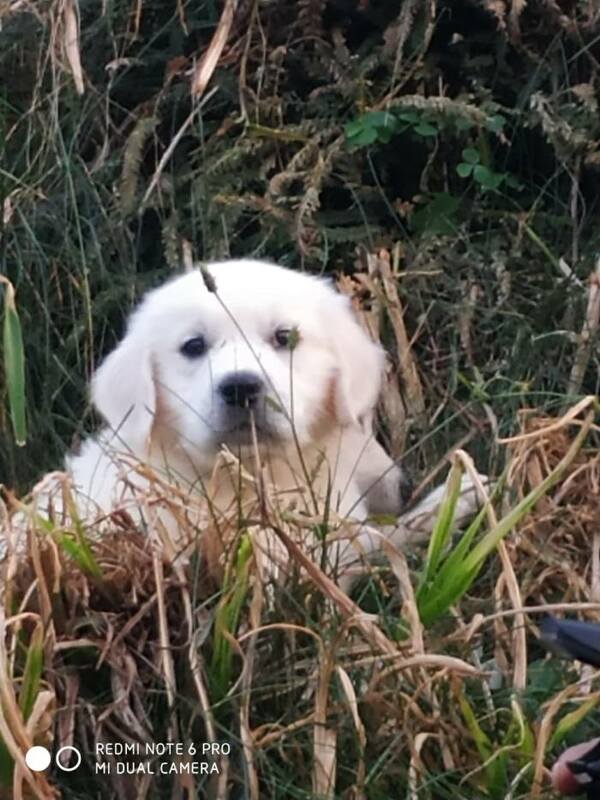 As a Kennel, Snowflakes is A Top Winning Kennels Into Goldens in the Asia-Pacific Region with its Base Stock Developed from World Winning Gene Pools Rated as the Best across the world. The Base Stock which we have Developed our Kennel on are Parented by Dogs from Some of the Worlds Top Kennel Like Erinderry of Ireland and Gunhills of UK, Whose Dominant Gene pools are Behind the World Winners of 2003, 2008, 2009, 2011, 2012 and 2015. To Really understand what we are talking about you should Search the Internet or click on the pedigree links for Dogs like Erinderry Diamond Edge of Glen Avis, Gunhills Blue River and Some others in Our Base lines considered to be some of the Best Dogs Ever in World of Goldens. You don't have to search the world over. The Best lines are already available in India with us. 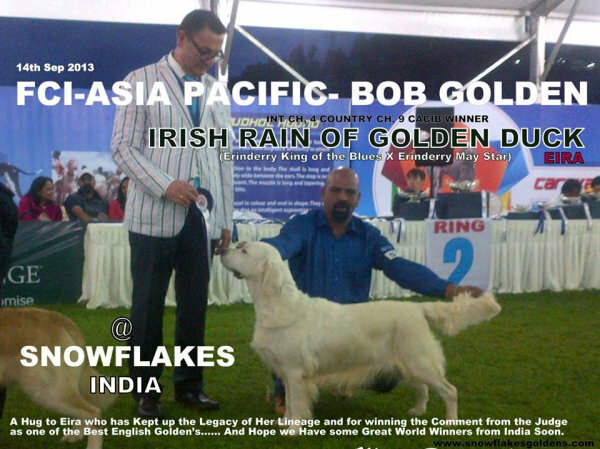 Snowflakes Works Towards Breed Improvement: Snowflakes India Supports the Growth of Goldens in Our Country and Improvement of Breed Standards to Make it at Par with the World Arena. We Run "The Golden Retriever Forum of India" to Bring Together all Golden Enthusiasts in the Country under a Single Platform and Also Encourage Breeders Handlers etc by Regularly Sponsoring Trophies at National and Semi National Golden Retriever Shows. Small efforts from our Side for the Cause. Please contact us to get our Face Book Link. As a kennel, today we go a step further to Collaborate with Breeders Abroad and in India who have Good Stock Preferably with World Winning Gene pool, Crufts Winners or Exceptional Quality Proven Otherwise in order to expand our Genetic Stock to Be no less than any of the Top Kennels across the World. In the process we get benefited from retained Cross Bred Stock Available for Further line Breeding. Snowflakes Shows & Winnings: Showing is restricted to Top Shows only where Snowflakes Dogs Have Won Many Awards on a Continuous Basis in National and International Shows in Multiple Countries, In India the Proudest Moment was When we won the Best of Breed at the First Asia Pacific FCI Show Held in India from None other Than the World Show Chairman of World Show Chairman 2014- Helsinki, Finland who is also one of the Most Sought after Final Line up Judges of Crufts and World Shows - Mr Kari Jarvinen, The Better moment was when he invited us Over to Show there. What More Can We Expect from Our Sweethearts Girls Rock, The Girl in the Picture is India's Top Golden Retriever, An FCI International Champion with 9 CACIBs from 4 Countries and also Probably India's only FCI Certified Working Dog. Price: Please contact us by email or phone for pricing of the puppies which will be according to their quality. Buyer Approval: Kindly note that Puppies are available only to Loving Homes, Show Homes and Breeders (who adhere to ethical Breeding Practices). Age for Re-homing: Puppies are handed over between 8-12 weeks as per International Breeding Norms. We Don't Entertain Separation of Separation of puppies from its mother below 54 days/ 8 Weeks, So if you are looking for a toy to Play with Sorry. Guarantee Policy: Show Class are completely checked for Faults and Guaranteed with Replacement Policy. On Our Side Even Minor Visible defects if noticed leads to such puppies removed as Pet Quality. General Replacement Guarantee is applicable for all Puppies in case of Serious Faults which is Generally Applicable for a Full year by which time faults of any are generally noticed. 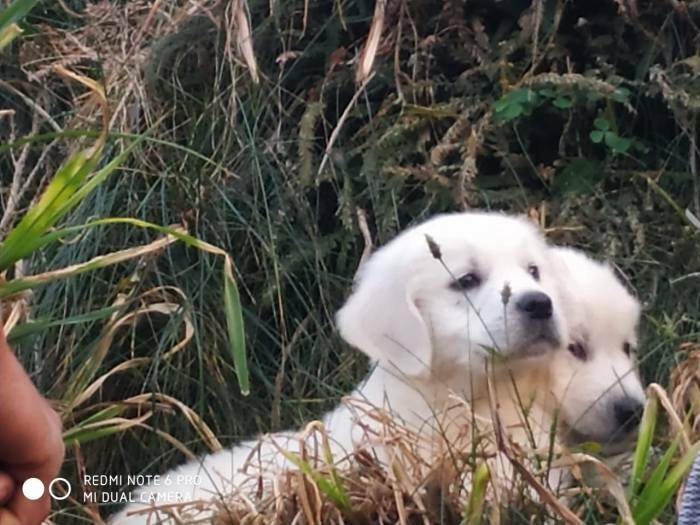 Bred in India: Strategic Breeding Plans are to have puppies Available through the Year from us to Improve Availability of Quality Golden Retriever Puppies in our Country in a Self Sufficient manner. Let us realize that we in India have greatly improved in the last 10 Years and a Collaborative effort from us should reduce Dependency on Overseas Breeders. So if your Family is not really prepared for it now, Don't hurry, Approach us without Worries when you are really ready for Bringing in your great Companion home. Pl Note: Most of the Needed Information is available above, Kindly Study well Before Calling, We are generally at Work During Office Hours and Would Be happy to Attend your Calls after Office hours or on Weekends if its not very urgent.